There was a heart-stopping moment when our car breached the top of the hill before descending into the North Yorkshire market town of Masham where the expansive views are revealed and everyone gasped. 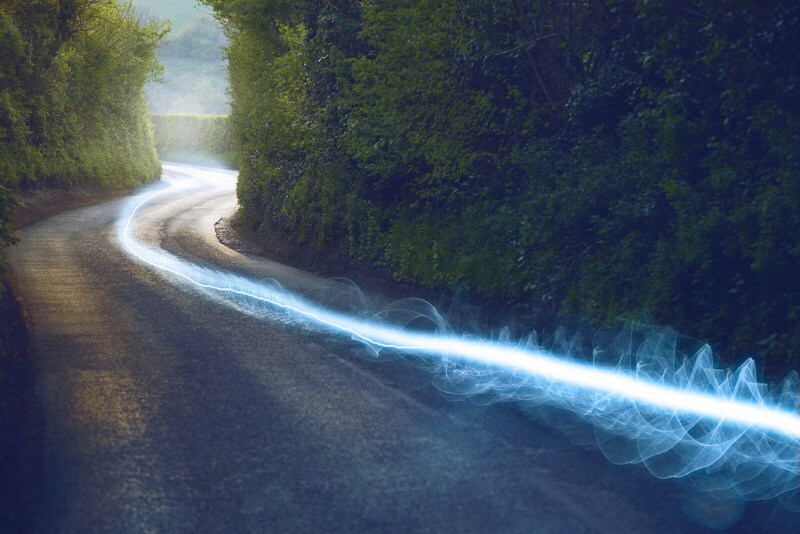 It was akin to the unrolling of a treasure map before our eyes. The Nidderdale Area of Outstanding Natural Beauty is one of 46 areas of protected countryside in the country and Masham sits on its North-Eastern flank with the cricket club off Silver Street. I was there on assignment for The Cricket Paper to cover one of Yorkshire cricket’s premier cup finals: the Black Sheep Yorkshire Champions Trophy. If you’re not aware, the Black Sheep features the champions of the Aire-Wharfe, Huddersfield, Bradford Premier League, ECB Yorkshire League North & ECB Yorkshire South Premier League. This year’s competition began back in May with Harrogate defeating Beckwithshaw by nine wickets and Wakefield Thornes edging Delph & Dobcross by 22 runs in a high-scoring tie. Both Pudsey St Lawrence and York (2016 finalists) got a bye. 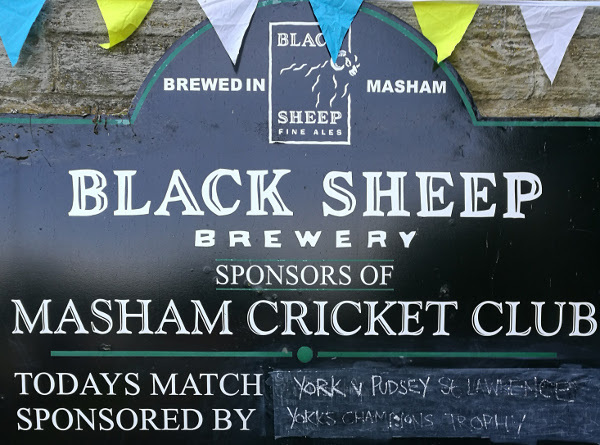 Subsequently in July, York beat Harrogate by 114 runs (D/L Method) and Pudsey St Lawrence eased past Wakefield Thornes by nine wickets to book their places at Masham, who had been awarded host club after the organisers asked the competition sponsor, The Black Sheep Brewery, where they’d like to see it go to in 2017. Arriving fashionably early well before the intended midday start time was to experience a sinking feeling and that wasn’t the rain-quenched outfield. It was mild, Masham was bathed in sunshine but the decision was that the square had taken too much rain in the preceding days to start on time. I get frustrated on days like these, as we all do, because much as I write prolifically about cake and the relative merits of the brews around Yorkshire, we’re all there to catch some actual game time. The day before I had been at Scott Hall Road in North Leeds to watch an identical scenario unfold at Leeds Caribbean except the square at the Dales Council ground was much wetter than Masham. 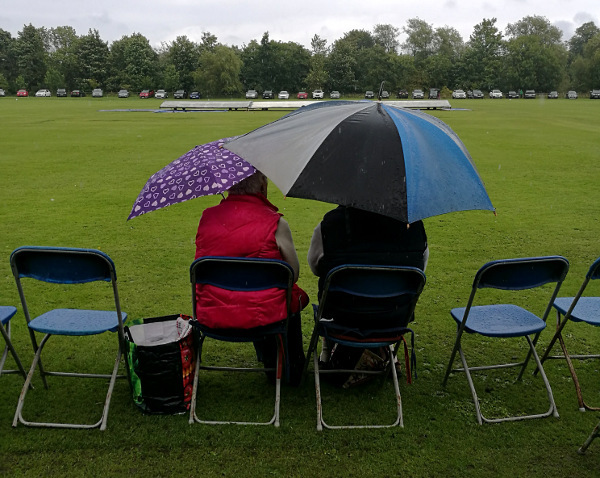 I’m not casting aspersions as umpires have a tough enough job but had this been a cup final for the Nidderdale League, Halifax League or Craven League then I suspect we’d have seen a few hours of play. Conversely, I do appreciate a truncated Black Sheep final isn’t quite the Yorkshire cricket showpiece everybody wants. If you get a chance to read my piece in The Cricket Paper next Friday, there’s a few thoughts on amateur and professional – because the two rub up against each other in club cricket – as well as the sliding scale of when playing on wet wickets is deemed ok.
A word on Masham CC whose first-eleven will be straining sinews this weekend to snap up only their second ever Nidderdale League title in Division One with all eyes also on top-of-the-league Ouseburn in the final round of matches. A talk with Chairman Mark Ellis was to get a feel for how the club’s fortunes have transformed in the last decade in no small way due to a decision to start a junior section because there were signs of Masham struggling to get two sides together. To their credit, Masham now appear to be in a strong position on that front with under sevens through to under 15s and they are beginning to see promising juniors ready for the transition to senior cricket: a satisfying milestone for any coach, parent and club. 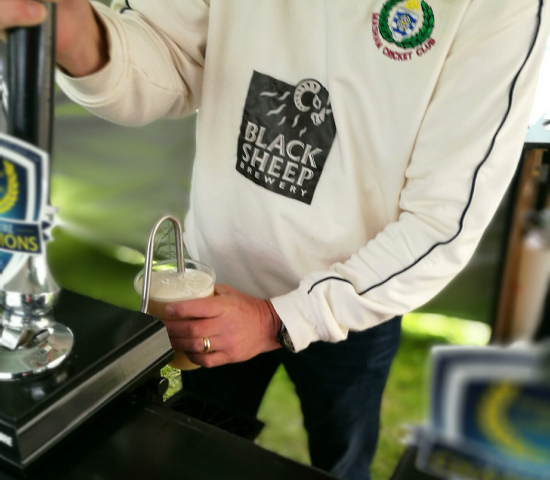 With no sign of cricket anytime soon, it was off to the Black Sheep beer tent to talk with Andy, Masham’s first-eleven leggie who had been part of the team that defeated Burton Leonard the day before at home to keep things interesting at the top. As I chewed his ear off about league cricket, life, the universe and leg-spin, there was a steady stream of requests for pints of Black Sheep Yorkshire Champions beer; initially launched to celebrate Yorkshire County Cricket Club’s County Championship success and still going strong apparently. 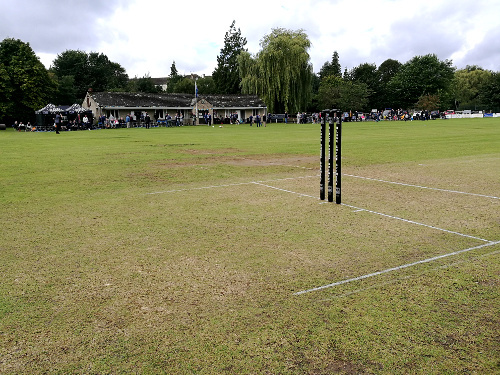 While juniors took turns to bowl and bat in the net, watched by a grazing sheep on the incline opposite, there were burgers being flipped and cakes sold nearby as Masham tried to make the best of a bad situation with its commendable hospitality. There’s no question both finalists take the Black Sheep seriously, with York selecting Yorkshire County Cricket Club duo Jack Leaning and Matthew Waite in the squad, though their approach to a delayed start differed. York had won the ECB Premier League North the evening before and were content to relax on the sidelines while Pudsey St Lawrence kept themselves occupied with football on the outfield. When the umpires had returned from the middle and declared an early tea around 3.30pm, I knew then what I knew at midday: that there wouldn’t be any play today. So, I took the chance to visit a couple of Nidderdale Cricket League grounds locally that were high on the list because of their unusual quirks. Thornton Watlass, with its mighty tree inside the boundary and small square to allow a comfortable drive to be launched at The Buck Inn off the square, is not to be missed. Neither is the joy of going to Crakehall who surely have one of the smallest club cricket boundaries anywhere in the world with a few paces from the cemetary wall. As for the Black Sheep Yorkshire Champions Trophy, its position as the premier knockout competition in Yorkshire has been undercut somewhat because the four winners of the ECB Premier Leagues now play each other to determine Yorkshire’s ultimate champion club. That being said, everyone I talked to – including both York and Pudsey St Lawrence players and supporters – felt a clear affinity with the Black Sheep that has a history going back to 1976 in its favour and its pedigree should stand the competition in good stead for years to come. 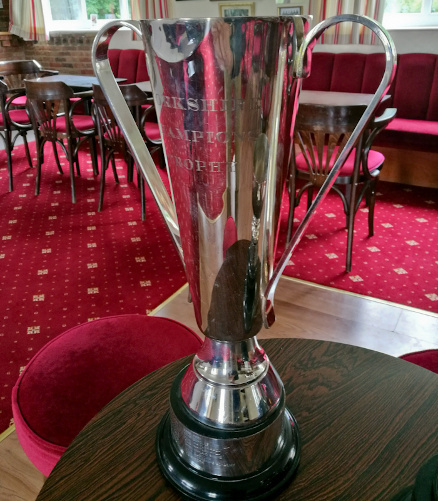 Due to the washout, the trophy, reminiscent of a metallic waffle cone with handles, wasn’t shared on the day but the aim is to return to Masham next season – as I sincerely hope they do – to sort out a champion. The ultimate 2018 pre-season friendly, surely? By sharing this article on Twitter and Facebook using the buttons below, you can help turbocharge the number of people who see this and get to learn about the Black Sheep Trophy and also Masham Cricket Club. To discuss club cricket, you’re very welcome to connect with Cricket Yorkshire, I’m @cricketyorks via Twitter & I’m on Facebook too: Cricket Yorkshire on Facebook. Thanks for visiting the website and though the cricket season ends in late September, there will be weekly articles here to enjoy right the way through the rest of the year and beyond.